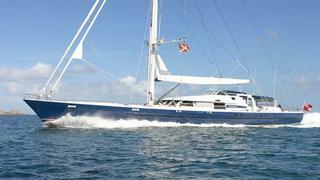 Always keen to explore new marketing avenues for yacht sales, Kevin Merrigan of Northrop and Johnson sends news of a guaranteed charter revenue option for the buyer of the 47.5m motorsailor MITseaAH. MitseaAH's asking price of $18.9 million now includes guaranteed charter weeks spanning the first two years of new ownership to a value of $2 million. This option allows a new owner to purchase a yacht ready for charter with booked weeks scheduled to offset the initial running costs. Built by the UK’s Pendennis yard in 2004, MITseaAH is ABS classed and MCA compliant, accommodating 10 guests in a master, three doubles and a twin and, being a motorsailer, can reach speeds of 22 knots.